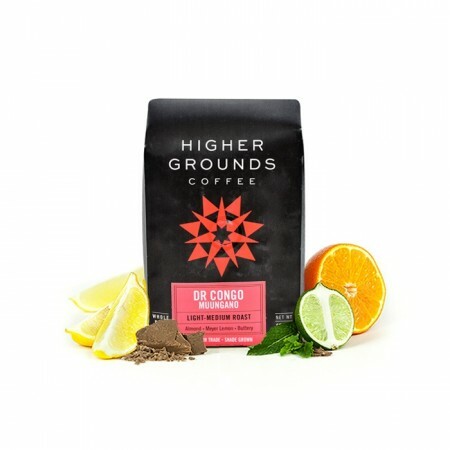 The Democratic Republic of the Congo Muungano was carefully roasted for you by Higher Grounds Coffee. This Fair Trade certified was grown by the Muungano Cooperative in the Kiniziere, Lake Kivu region of Democratic Republic of the Congo between 1,450 - 2,000 meters above sea level. The cup has notes of sweet almond and meyer lemon acidity with a buttery, full bodied mouthfeel. This coffee was a little disappointing. Its acidity was thin and windy which didn't compete well with the nuttiness that came across very strongly. It almost bordered on underdeveloped but the roast looked great which leads me to believe it was just a subpar coffee. Amazing smell. Smells better than it tastes, but the taste is great and it definitely delivers a full bodied mouthfeel. Tastes and smells more like a light roast than a medium. The citrus is very muted. It tastes darker due to the nuttiness. This coffee really grew on me. It has a full, lovely flavor. Nothing sticks out of the texture -- it's just delicious. Taste is just not very good. The lemon flavor is apparent but it tastes burned and bitter. Probably not even finishing the bag. Nice flavor, but a bit light. I use French Press; some reviews said pour over might be better for this one. Interesting, but maybe a little too citrus for my tastes. Excellent cup of coffee, well balanced flavor profile. A nutty/buttery taste with a slight citrus kick. Pour over recommended. This coffee was pretty good. A bit lighter than the last one, but still enjoyed it. Fantastic balance. Used for pour overs.